Under very difficult weather conditions, the three drivers of AT Racing did a great race. 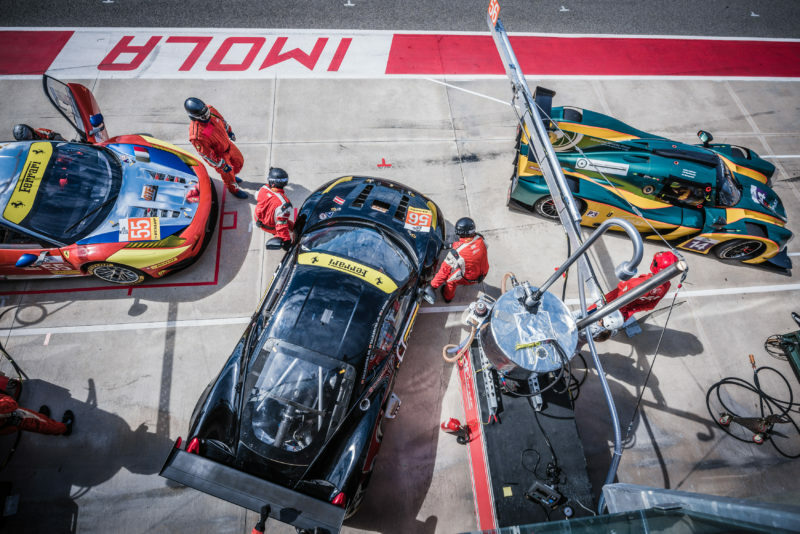 They crossed the finishing line without any problem, in the 3rd place for this second round of the European Le Mans Series, on Imola track (Italy). The second round of the 2016 European Le Mans Series season took place at the Italian Autodromo Enzo e Dino Ferrari in Imola. Even if weather forecast were announcing bad and wet conditions all over the week-end, the free and qualifying sessions took place a on dry track and under a clear sky. But the end of the race could not escape the storm and the 4 Hours of Imola 2016 finished under safety car. During both free practice sessions on Friday and Saturday, the AT Racing drivers Davide Rigon, Alexander Talkanitsa father & son worked on the car set-ups for this circuit which is quite demanding for the car and the drivers. After Silverstone, where Alessandro Pier Guidi was in charge of qualifying the car, it was the turn of Davide Rigon, who jumped in for Alessandro who had a clash with the Blancpain race in Silverstone, to be at the wheel for qualifying in Imola. He took n°56 AT Racing Ferrari 458 LMGTE to the second starting line, 2.5 tenth behind pole setter. RACE : Alexander Talkanitsa jr. started the race and was in charge of the first stint. Alexander Talkanitsa sr. took over after 32 laps for a double stint, while Davide Rigon took the car to the chequered flag, but the last hour of the race took place under pouring rain, therefore Davide drove most of his time under FCY. With this horrible weather conditions, the race director even decided to finish the race under safety car statement. With 33 points from the first two races n°56 AT Racing Ferrari 458 LMGTE are currently 2nd in the championship. There is now a two-month break before the third round of the six-race ELMS held at the Red Bull Ring in Austria on 17 July.